Bella is retired. She has been a sturdy steed, served well, got me here but was starting to need more attention. She will be stripped and donated to the Diabetes Association, doing good somewhere else. So, I get a job, and what next? Went out and bought a new car. I couldn’t go into winter without putting new tires all around, and the rear brakes needed work. Besides, I really don’t need a van now that I’m here. So, with a steady income behind me, I went to check out what’s the deal with new cars, and bought a 2010 Hyundai Elantra. A real grown up car. Got a great deal, manageable payments, five year warranty, and new snow tires. It feels good to drive on good tires – what a difference. I was talking to Gabe this evening, and he said he needs tires, his are just about bald. That is not the kind of thing you tell a mother! One more thing to worry about. 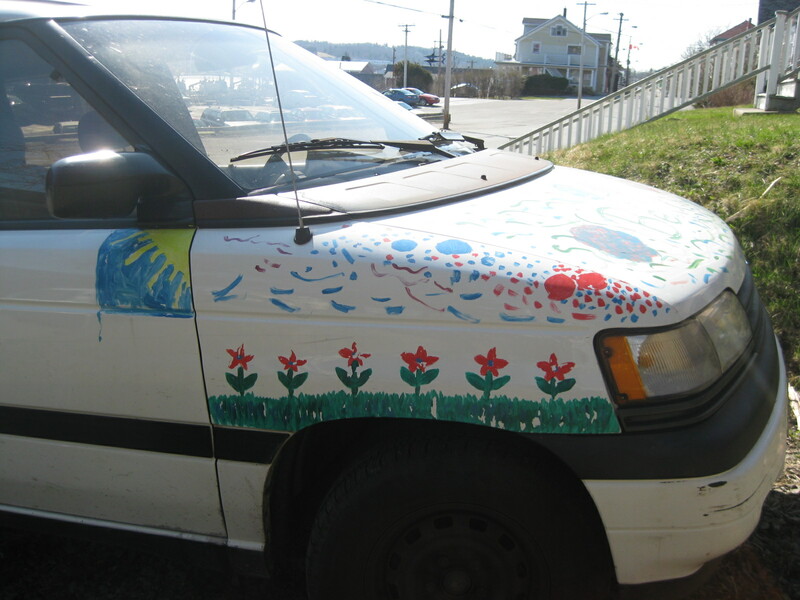 Anyway, I am getting an urge to paint maybe just a small flower on the Elantra. Why not? It’s my car, and I plan on keeping it a long time. Haven’t named it yet – have to get to know it a little better, bond a little stronger. I am having fun driving though. Where can I go now? I am also enjoying the job. Lots of people, lots of variety and using skills that I have. I am looking forward to facilitating programs, I do love small group work. I’ve also gone onto the board of the local women’s shelter as well, and am getting my teeth into the challenges of that. I realized this weekend that there is a level of anxiety that is gone, and energy freed up for something else. i bought a used clarinet, and am beginning to squeak and squawk – it needs re-corking, so the sound is not great, and my muscles need to get stronger. It’s fun though, and maybe next year I’ll be making music again. Can you remember all the cars you’ve ever owned? My first car was a VW beetle, green, that Grammy bought for us so Mary and I could get from Berea to Magnificat. It was a sweet and reliable car. I can remember driving without brakes, and running into curbs to stop. One time the windshield wipers stopped during a rain storm, and I could just reach my hand out the window to wipe away the rain. Talking about rain, we had some crazy weather last week. A nor’easter blew in on Friday, and didn’t stop for 24 hours – loud and strong. Honestly, I’ve never lived anywhere with wind like that. It woke me up when it started blowing, so loud. It rained so hard, with such wind, that it was blowing the rain into the living room where the eaves meet the roof. I had every pot and bowl in a line on the floor to catch the water just pouring in. The drapes were soaked, the floor was wet – I didn’t have enough towels to soak it all up. Constant steady patter patter patter. When the wind shifted, the leaking stopped, but it kept raining hard and steady for another day or two. Once that passed, we have had three absolutely glorious days, double digit sunny mild days. In the middle of November. I talked to a friend today who went canoeing this afternoon! Another spring day. The weeping cherry and apple trees outside my window are getting ready to bloom. It’s very windy though – so windy a couple nights ago that it kept me awake for awhile – steady strong wind making such a racket. This morning the house was groaning in the wind, sounded like an old man moaning. I watched Snow White and the Seven Dwarfs on TV last week. It is the first movie I ever went to a theatre to see. I was maybe four years old, and Dad took me. It was so exciting to go into the dark movie house, but when the witch came on I was so scared that I threw up, and Dad had to take me home. Meg threw up at Return of the Jedi. Too scary. But, Snow White was always one of my favourites. i remember going to the drive-in to see it when was about 10, and couldn’t see it, my eyes had gone short-sighted and soon after I was wearing glasses. Watching it again, I realize that it was another early influence that sent me to the woods. The little house where the dwarves lived was so charming, but more than that was how all the animals were there to help, all pitching in first of all to save Snow White, and then helping clean the house, wash the clothes, make a meal. What could be a more perfect life than to live in the woods in harmony with nature? I enjoyed it again even with my adult analytical mind unpacking the theme of a woman living with seven men and keeping house for them, although she treated them like naughty children. Their mistrust of her – a woman – was also supposed to be comic, but what!!!! Nevertheless, evil is conquered, love redeems and all live happily ever after. Be cheerful, whistle while you work, keep love in your heart and live in harmony and openness. Went to a pilot radio show a couple days ago, Bluenose Opera House. It was fun, and lots of great music. Coco Love Alcorn is a rising star, and lovely to see her live. It was in a large hall in Riverport, a small community on the river! The hall had no heat, but is set up for recording and hopefully will become the studio for the new program. Today went to a film by a local filmmaker about food sustainability in Nova Scotia – how many farms have been lost over the last few decades, 85% of our food is now imported. We could be self-sustaining, but there is not much incentive for farmers to remain on the farm. It was disturbing but inspiring as well. Makes the support of local food producers seem more urgent – go to the farmers’ markets, buy local, grow something at home, be aware of the source of our food. Mom is going in for surgery to relieve water on the brain next week. I’m confident it will help her symptoms but feel a little apprehensive about the prospect of an 83-year old woman going through any surgery. Keep good thoughts and grace surrounding her. Gabe is 35 today – holy cow. Hard to believe it all happens so fast. I am so blessed with him in my life, and so proud of the man he is. Spent the day in Sedona with Gabe. Got my hair cut. It will be way easier being on the road, and feels great. Another shedding of the old, getting simpler. Did laundry. We took a hike in the afternoon to a petroglyph site. The Sinagua left these pictures 800 years ago. We sat above the trees on a red ledge. It is so very beautiful here, familiar and not. We all know this landscape from cowboy movies. There is a lot of vegetation yet it is desert. Gabe prepared a tasty curry for dinner and we watched “W” for about 45 minutes and got bored, so put on “Wall-e” and enjoyed that. It is a very sweet movie.